The New Year, as we promised, started out quite active and with a bang! The first and a very important concert, took place on the 8th of January in Serbia where we opened the cinema and music festival of Emir Kusturica "Kustendorf". Kustendorf Film and Music festival is much more than what its name promises. It is the demonstration that, even nowadays, a utopia can exist. Everything there was unique and extraordinary. A place that nourishes itself with beauty, originality and passion. A place open to young artists from all around the world that have the possibility to meet each other, to see and hear each others’ work, to listen and speak with great international artists. After our home return, we set up in the studio rehearsing for the important upcoming concert – first in Chisinau and the following Europe Tour. "Since I saw the commercial on TV saying that Chisinau Beer organizes the Zdub's concert, already then I saw myself there. And so it was. Since morning I've been having an emotional rollercoaster, especially due to the fact that I missed out on their last concert the previous year. Then, finally, I stood at the place of honor, meaning precisely in the middle of dance floor, where the energy was the most dominating. I heard and felt Valerica's trumpet, so close he was, and regarding Roman, I am at a loss of words, how many exchanges of positivism took place. The energy poured continuously, positive energy and the state of euphoria, nirvana, trance, everything you want … I felt all of them yesterday. Take a deep breath and listen, read, inhale the zdubism through words and give this happiness forward. STAAART! The presenter (A. Shishkin) gave a start with an Elvis Presley song, "Love me tender", and announced that this concert is: "ANTI ... ANTI >>>> ANTI WHAT DO YOU THINK? "ANTIGLAMOUR" AND ANTICRISIS, but more Antiglamour". Roman was also wearing this sort of T-shirt, a yellow one, with a picture of a Moldovan girl holding a basket in her hands and a written below "Antiglamour". The concert started, the vibration of excitement was felt thorough the hall. It began with "Hora Cosmica"(not with "Cuculetul", as usual … ) Next, followed the song in Russian about Ileana (Balcanica) … There were also "Tractorul", "Nunta extremala", "Zdubii bateti tare", "DJ Vasile", "Everybody in the casa mare" … even "Maria blues". We created a little hora on the stage and "Da-i foiala cu scanteeeeiii!" (Let's party with fiery sparks!). I never thought I would ever be on one stage with them, near them, but I think it was a hidden wish of mine which flared up last night. After our multinational Moldovan hora has ended, I thanked Roman. At "Videli Noci" we jumped into the crowd and made a big hora on the dance floor and in that big one there were a lot of little horas. A Zdob [shi] Zdub concert is the best remedy; it isn't just anti-crisis, anti-glamour, but also anti-depression, anti-war and is more pro-peace, pro-love, pro-Moldova … in a nutshell "HAPPY ROCK'N'ROLL!" – back to the name on the poster which, I too, got hold of. Everything was much better than we expected. There were two girls in the back vocal Olga and Aliona. Their singing and dancing was excellent. When giving autographs, Roman was very quiet and beaming, and had the patience to everybody … Surely, we too got a hold of autographs and pictures. A humongous doze of positive energy, along with happiness, joy and muscle fever, pictures, video, life time memories and "flower from Roman", given to me after the on-stage-hora. On the following day of the Chisinau concert, the Europe tour and club A-38 was awaiting us in Budapest, Hungary. The countries, cities, club concert stages, airplanes, trains, busses kept changing … all of them escorted by the flu which we caught back in Chisinau, but our energy and moods was restored by the atmosphere of the clubs. 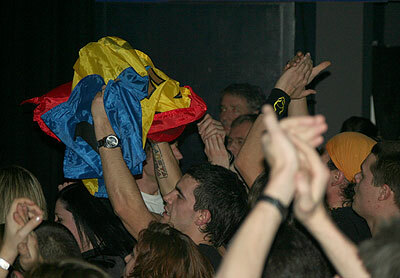 A first for us was concerting in Prague, in "Rock Caf?" club. The premier was a success. After the show we received invitations for 2 light summer festivals in the Czech Republic. We also visited the motherland of our friend Hubert von Goinsern – Salzburg, where Hubert was invited to our concert at "Rockhouse" club. 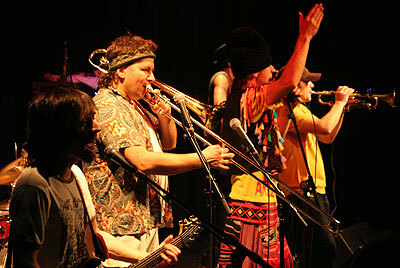 In our closing Europe tour "Ethnomecanica Europe Tour 2009", we have visited 5 countries, held 9 concerts during the 10 days of being in Europe and the schedule includes countries such as Hungary, Austria, Germany, Switzerland and Czech Republic. This tour was easier than the April one, we sang it in one go, gathered a lot of creative ideas which we will be working on in the studio! Our next Europe tour this year is planned to take place it October-November.